There’s no denying the appeal of Threes! (and 2048, to some extent). Sure, they’re simple games about sliding numbers around to match and increase, yet somehow, that’s also a formula for fun and addiction. One 4096 Hexa does its best to mimic, albeit on a hexagon grid! A clever twist for sure, which increases the challenge and makes for a noticeably different experience. Two plus two equals four. Four plus four equals eight. Simple enough, and even when you get to higher numbers like two-hundred and fifty-six, it’s still relatively easy to deal with. The additions anyway, as the same can’t be said about ensuring free space on the grid. By the time you move into triple digits, chances are you’ll have accidentally cornered one or more tiles, at which point it’s pretty much over. That’s what kept happening to me anyway, as I got too caught up in the fun of making numbers grow, completely losing sight of the bigger picture. Not that there’s a lot to keep track of, as you can tell by the above screenshot, but you do still have to plan ahead to reach that glorious 4096 (victory condition). Well, however little can be done anyway, given the complete lack of a ‘this number will enter the field next turn’. You do get two undo’s per round, but still… an odd omission. Oh and you’ll also have to deal with immovable blocks, which can only be removed by sliding the same number onto them. So… think you have what it takes to reach 4096? Hit the links below and let’s find out! 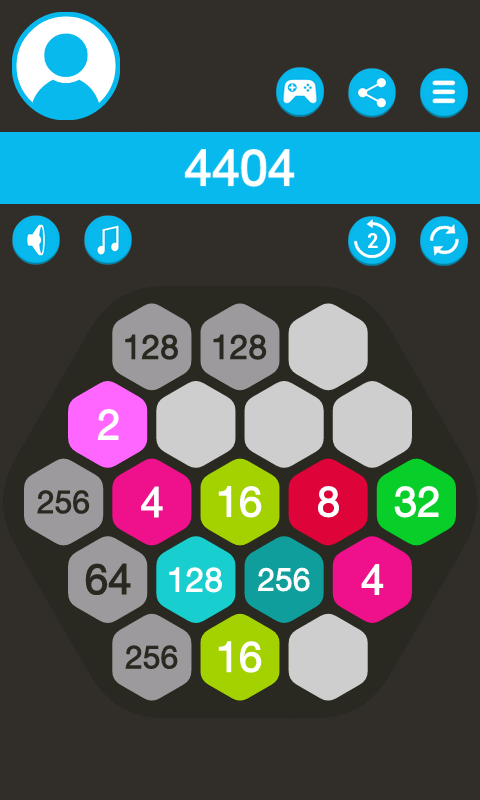 4096 Hexa can be played in a browser (HTML5) and on most Android devices (Google Play, $1 to remove ads).